Recently on Terra Urban (Participation and the “Han ji syndrome” ) we argued that opening participatory arenas is not sufficient to empower the most marginalized citizens. The urban poor often reveal to be uncomfortable, helpless if not apathetic when invited to participate in the public sphere. To put it very bluntly, organizing meetings and joyfully cheering citizens to “Speak up! Speak up!” does not appear as the most relevant strategy to make them “speak”. We coined the expression “han ji syndrome” to express the fact that destitute populations usually tend to passively say “yes” to whatever is proposed to them, rather than defending their own opinion. In this article, we will try to reflect on the possible antidotes to this han ji syndrome. Rather than a miracle recipe, we will propose here some elements likely to generate within the urban poor a culture of public contestation. Similarly, instead of practical recommendations (that would be anyway hard to replicate universally) we will rather describe general guidelines. The objective of this article is to determine how is it possible to transmit fragile citizens the power to say “nahin” and enable them to truly seize the opportunity offered by participative arenas. 1) Instead of being normative, let us be rational: why the urban poor should participate? Normative arguments will not suffice to convince marginalized communities to participate. Stating that the engagement in the public sphere is something good by nature is both poorly persuasive and inaccurate: participation can indeed be very costly (time and money wise), and even hazardous (when confronted to aggressive authorities), for weaker citizens. Therefore, generating a culture of public contestation requires the use of more rational arguments. To truly engage themselves in the participatory process, local communities should be able to visualize the concrete benefits that they could gain by raising their voice. Participation should make immediately sense to them rather than being an abstract theoretical democratic project. However, making participation “concrete” is not necessarily an easy task. The major challenge here lies in the fact that slum dwellers are often submerged by very various sorts of urging issues and might have difficulties to focus their attention on one given problem. As a consequence, the participatory process often appears blurred to inhabitants, who do not perceive quite well where the project is taking them. This lack of horizon reduces their interest in the project, and eventually fuels the han ji syndrome. To tackle this difficulty, it is important to help the community to quickly set up priorities and, even more importantly, to stick with these priorities. Similarly, in order to make meaningful the participatory process, it is also indispensable to go beyond emergency, and to try to make inhabitants aware of the long-term coherence of their action (for instance by showing them that solving one issue might help them out to solve the next one). 2) Knowledge as the key to participation: yes, but how to “sustain” knowledge? Appropriate information should be considered as the foundation of any successful participation. If citizens are aware of their rights and of the strategies to defend them, they will themselves feel the need to raise their voice. This affirmation has nothing revolutionary: informing has always been a central pillar of social work. The question we now have to ask ourselves is “how”. How to inject regular and updated information and how to ensure a satisfying level of penetration of this knowledge within the community? The “Slum Improvement Committees” set up by PRIA in Patna, Biharsharif, Chhapra and Bodhgaya might provide an answer to this question. 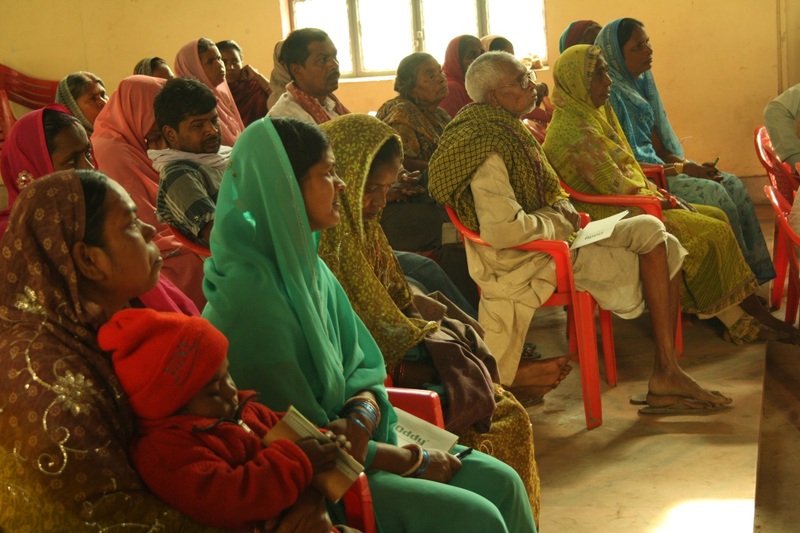 These committees, comprised of 5 members chosen among the inhabitants, work as channels of information for the neighbourhood: in constant interaction with PRIA, they are able to collect regularly the intellectual material relevant to their particular issues, and are then supposed to spread this knowledge to the rest of the community. For PRIA, this system is really helpful: it allows to save a lot time and to enhance the circulation of its message within the urban poor. Yet, does this system of transmission of information – based on a constant connection with a NGO – truly help local communities? On the short-term, it does seem so: the inhabitants can get access to crucial information in order to combat their fights. But, on the long-term, is this channelling of knowledge sufficient to empower citizens? The answer seems here less categorical. Observations on the field suggest that, in such configuration, citizens become heavily dependent on the NGO. If they do not get the information provided by the NGO, they do not move on. Most often, indeed, inhabitants wait passively that the NGO tell them “what to do”. Henceforth, they do not have the capacity to be pro-active, to obtain by themselves the information they need, and eventually to tackle autonomously their issues. This dependency leads in the end to the perpetuation of apathetic behaviours (aka the “han ji syndrome”). Therefore, while providing knowledge to the urban poor seems absolutely crucial, one should always have in mind that the transmission of information should not be alienating. Genuinely empowering marginalized citizens would imply to generate a “dynamic of learning” within the community and also to be able to extract ourselves from this dynamic afterwards. In a word: we should find a way through which citizens could inform themselves independently. The challenge is here obviously immense and not necessarily gratifying for NGOs. But it should be in the horizon of any social worker aiming at “awakening” poorer citizens. One alternative here would be to create a dense network of slum dwellers (and, possibly, of slum improvement committees) through which destitute communities could exchange their concerns, their successes, their strategies. Such internal circulation of knowledge – which could be possibly fostered by an NGO such as PRIA – would for sure allow a greater appropriation and autonomization of the process of information. Concretely, how about a gazette written and published, with the assistance of an NGO, by slum dwellers themselves and then distributed in all the slums of the city. Such gazette would offer a platform for marginalized citizens to learn about the challenges (and possible solutions) faced by their counterparts, and thus favour an internal flow of information. A third “ingredient” which could potentially spark a culture of “nahin” instead of “han ji” would be to stimulate a true sense of self-confidence within destitute communities. On this point, once again, social workers share a great responsibility. While it has become banal (if not fashionable) to invoke community participation as a tool for empowerment, the truth is that the voice of marginalized citizens is rarely put at the centre of the process. In the last two months, I have attended a dozen of community meetings organized by different NGOs across the State of Bihar; all these meetings officially aimed at offering the urban poor the opportunity to learn and to speak up. In practice, however, inhabitants usually spoke for less than 5% of the total duration of the meetings. And when they spoke, it was usually to say “han ji”. It was striking to see how NGOs, while appealing at the very same moment for a greater participation of the urban poor, ended up invariably by monopolizing the microphone. Interminable monologues, disproportionate amount of time dedicated to deference vis-à-vis state officials, very little attention paid to feedbacks from the participants, etc… When interrogated about this disequilibrium, the organizers of the meetings would invariably reply that “inhabitants know nothing, so they need first to be informed, and then they will talk”. If we add up to this approach other biases in the organization of the meetings – such as the fact that inhabitants would frequently sit on the floor while organizers would enjoy chairs, or the fact that excessive politeness would often be unilateral – the final result did not appear absolutely empowering for the participating citizens. One might argue that these elements are merely symbolical. But isn’t the symbolic of power highly meaningful? One might also point out that inhabitants themselves, especially in the Indian context, usually give credit to the hierarchical relationships; but isn’t it the role of social workers to change these mind-sets? The clear-cut divide between knowledge-providers and so-called populations to be enlightened seems to represent a real barrier in the emancipation of the latter. Our argument here is that promoting participation is one thing, but truly considering marginalized citizens as equal intermediaries is another one. Too often, citizens are “invited” to speak but are not truly proven that their voice as an equal value. Rather than perpetuating hierarchical relationships (most of the time unconsciously), social workers should be the first to foster self-confidence within the targeted populations. It is the responsibility of NGOs to give up paternalistic approaches, according which inhabitants need to be lectured, and instead give a real room for the citizens’ voice. Offering them the possibility to speak right at the beginning of a meeting or, even more importantly, accepting ourselves to sacrifice our own airtime would be a good starting point. An optimistic conclusion: NGOs can actually do something to eradicate the han ji syndrome. What we wanted to show in this article is that NGOs have a prime responsibility in the han ji syndrome. They have the possibility to struggle against it, but they can also potentially feed it. Creating structures for participation is a first necessary step to enhance the capacity of destitute populations to defend their rights; but it must be complemented by further measures if we want to see citizens genuinely empowered in the public sphere. Creating sustainable channels of information, enhancing the self-respect of inhabitants, and making them integrate the possible benefits they can derive from participation are objectives that NGOs could easily implement. It might not be a miracle recipe, but it seems to be indispensable ingredients for empowering participation. Recently an International Conference on Inclusive Urban Planning was organised in Delhi by Ministry of Housing and Urban Poverty Alleviation. Result of this conference was a ‘Delhi Declaration’ that aims to articulate steps for an equitable and inclusive urban planning approach. Participated by over 100 policy-specialists and experts comprising the delegates from the Government of India and constituent States and cities, experts from North America, South America, Africa, Europe and the United Kingdom, South Asia, East Asia, representatives of the World Bank, Department for International Development, UK, Asian Development Bank, United Nations Development Programme, and research and teaching faculty from Indian institutions, the International Conference deliberated on issues of the inclusive nature of urban planning models, reviewed the planning models practiced in the world’s cities, and considered the institutional, legal and regulatory frameworks for urban planning. Regulatory and institutional frameworks for planning require to be reformed such that that these are able to recognize the urban poor as stakeholders and ensure that their inclusion in the process is intrinsic to urban planning. Promotion of responsible planning with community involvement focusing on the urban poor will also help conserve and renew natural resources, reduce the urban carbon footprint, and preserve and promote culture and heritage, thus creating healthier and sustainable cities. There is always a concern as to how to make a dominant government work on issues of deprived and poor. These concerns grow up when government is cemented with strong bureaucratic structures and weaker community interface. Civil society, taking initiatives to strengthen community’s interface with the government and make it consider their problems and issues, grapples with the problem of ‘making government listen’ which could later lead to ‘making government work’. In the plethora of issues of urban poor, consolidating and strengthening the voice of civil society is a major objective of national and international organizations working for the betterment of the urban poor and to ensure inclusive governance. There is a need to strengthen informal networks, initiatives and social movements and turn into a structured effort of policy advocacy. The proposed Community of Practice (CoP)/ ‘working together on urban poverty’ consultation at Bhopal discussed advocacy experiences of various prominent organizations on urban poverty issues in MP and explored possibilities of a shared and effective platform/forum in order to engage with the government. (2) To explore a common platform where a collaboration effort of advocacy on urban poverty can be taken. Meeting started with an overview provided by Dr Yogesh Kumar, Executive Director, Samarthan, on the urban scenario in MP, major issues involved with the urbanization and scope of civil society organizations to intervene in collaborative manner. He also spelled out the objective of this meeting and need for a collaborative effort to place organized energy for the cause of urban poverty. A presentation was made on the issues and prospects of advocacy on urban poverty issues. Presentation discussed three major issues i.e. Advocacy by smaller civil society group; Advocacy on small towns; Advocacy in small towns, that are pertaining to urban advocacy. Efficiency versus delivery capacities of local urban administration: There are lowest scores in various services in small towns recorded through various report cards that Samarthan and other organizations have brought at times. Delivery mechanism is not able to deliver services with most efficiency. Exclusive nature of urban planning: Urban planning remains exclusionary in nature and do not accommodate common people. It is still being done by consultants or departments, not by local people. Lack of conversance among various departments and resource to implement components of urban planning. Low ability of elected representatives in engaging with the development process in the towns. Parshads (councilors) do not know how to utilize the money and their individual grants. Mr. Narendra Sharma from Action Aid emphasized that on the name of efficiency and transparency, most of the basic services are being privatized based on PPP model and becomes responsibility of private actors. He mentioned a study on water by Manthan to support his argument. Surendra Khadge from VJSS, Indore shared his experience from Indore that in the name of development and rehabilitation, 7000 people have been shifted away from city where they do not have access to basic facilities and they also lost their means of livelihood. In some places, rehabilitated families are forced to make their shift at 20 km away from the city. He also made a point on increasing urban slums in Indore from 599 in 2006 to around 800 in 2011. 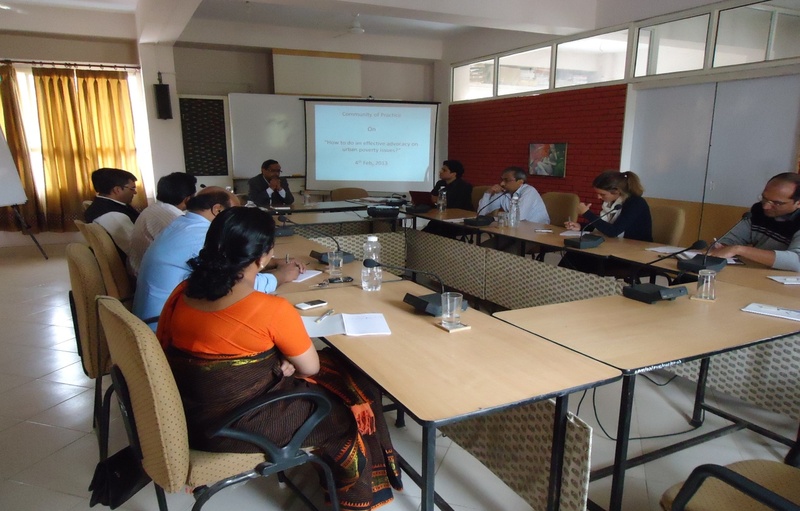 Dr Pradeep Nandy from UN Habitat emphasized on the use of information and validation data to be used in advocacy. He stressed upon a point that whenever we use data for the said purpose, they should be validated by concerned authorities and also compared and consulted with previous studies. Mr Sur from population Foundation of India shared that advocacy efforts with government authorities have not been very successful. So, he stressed upon the need that we should seek some alternative methods of effective advocacy. Binu Arickal from water Aid raised suggested that PPP should be used to ensure rights of the people. Jeetesh Rai from PRIA suggested to include violence against women in the agenda of urban poverty of the CSOs. Shyam Singh from Samarthan advised to include elected political leaders in the advocacy efforts. Dr Rose from Clinton Foundation also endorsed this point. Dr Yogesh Kumar made point that Ashray Nidhi was way to get away from the system of rehabilitation of people. Nobody is representing the interest of economically weaker people. We need to look at Bread earner especially women, who have not been given priorities in planning. Poor may be willing to pay if they are provided better services. But indirectly, they are paying much. He also said that citizen collectives can play important roles in bringing changes. He emphasized on the need of building capacities of urban administration and elected representatives. Dr Yogesh Kumar suggested that we can put our programs together for our learning that organizations are gathering through their own interventions. Organizations can link with inter-connected issues. By using experiences from each of us and identifying the issues, CSOs can engage with the government collaboratively. Some time administration also needs our support to strengthen good initiatives. He suggested all partner organizations to meet for 2-3 hours once in one or two months and share their experiences. Narendra Sharma suggested we should bring more partners to these meetings. We should discuss issues like earmarking of land to urban poor, security issues, planning and audit issues with priority. Binu Arickal said that we need to have regular dialogue through meetings. We also need to build civil society’s capacities. Meeting should be held every month. Meeting or partners on the first Saturday of every month. Meeting should be organized by partnering organizations in turn basis. 2nd meeting to be held at Samarthan premises on march 2nd. The author of this article, Hugo Ribadeau Dumas, is a master student in urban governance (from Sciences Po, Paris). He is currently interning with PRIA in Patna, Bihar. “Han ji”(Yes sir). These two words could sum up very well the spirit of slum dwellers when interrogated about participatory processes they are involved in. Did you find today’s discussion fruitful? “Han ji”. Did you understand everything from yesterday’s training session? “Han ji”. Do you agree with the next steps we are suggesting you for the slum improvement committee? “Han ji”. Whatever dry or disorganized meetings might be, the reaction of the inhabitants will almost invariably fit this “han ji framework”. Social workers familiar with the field will probably agree with this point: the tendency to acquiesce without questioning too often characterizes interactions with the most destitute citizens. The roots of this relative apathy are numerous: lack of skills (to speak in public, for instance), lack of confidence (“Won’t sahab be upset if I tell him I did not like his meeting?”) or simply lack of interest (“What difference does it really make if I did not understand?”). But, more generally speaking, putting aside the reasons for this lack of critical reactivity, the “han ji syndrome” shows us that participation does not necessarily imply empowerment. Giving poorer communities the opportunity to raise their voice is for sure a decisive step in this direction. But it might be insufficient. What we can see on the field is that a great share of citizens involved in participatory institutions (such as the Slum Improvement Committees, set up by PRIA in various cities of Bihar, Rajasthan and Chhattisgarh) actually follow instructions without integrating them: they accept to attend meetings, they accept the rules of the participatory programmes, but to which extent are they aware of their meaning and ultimate objectives? They often “participate” without truly grasping what it could potentially imply in terms of autonomization and community strengthening. In other words, they do not necessarily see participatory processes as “theirs”, but rather as something ”higher than them” brought by outsiders. It is revealing that, when asked about the reason of their participation in a meeting, slum dwellers often answer “because somebody asked us to come”, without referring to their personal expectations. In the same vein, when interrogated about the agenda of Slum Improvement Committee’s regular meetings, it is not rare that inhabitants simply answer “whatever you want to talk about, Sir”. Such observations do not mean that slum dwellers do not care about the meetings; they are on the contrary usually extremely attentive to what is being said to them. But it shows that their participation remain largely passive, not active. Which explains the prevalence of the “han ji syndrome”. The role of organizations such as PRIA, whose goal is to offer the urban poor the tools to combat their own fights, is surely to destroy this “han ji reflex”. A major challenge is to generate instead what we could call a “nahin posture” (a “no posture”). In order to genuinely appropriate participatory arenas, citizens should be ready to say “nahin”: nahin, I did not understand what you told me; nahin, I do not agree with you; nahin, I think what you are proposing us for the future will not work out. Such critical stand would prove that inhabitants have integrated the challenges implied by the participatory process, and that they truly feel part of it. It is our responsibility to help local communities to pass from “han ji” to “nahin”. By multiplying meetings, by spreading knowledge within the neighbourhoods, by encouraging debates, a certain culture of contradiction, contestation and protestation might emerge from these populations. It obviously requires time and a strong involvement at the grass-root level, not only of the inhabitants but also of supporting-NGOs. For promoters of community participation, like PRIA, it also implies encouraging inhabitants to be critical about the whole participatory process and therefore accept amendments from inside. The second part of this paper, which will include proposals on how to struggle against the “han ji syndrom”, will soon be published on Terra Urban. While the “city” of Bodhgaya might be characterized by a negligible demographic and geographic importance, its influence and prestige at the international scale is nevertheless undeniable. Officially labelled as a class-III town by the government, the nagar panchayat of Bodhgaya had a population of just 31,000 people according to the 2001 census. But it is at the same a major destination for tourists and pilgrims: hordes of visitors come here from all over the world come to visit the Mahabodhi Temple, famous for being the stage of the Enlightenment of the Buddha, and recognized as a World Heritage Monument by the UNESCO in 2002. The international dimension of Bodhgaya, and consequently its economic potential and its brand value for both India and Bihar, is a strong parameter in the urban development of the city. It is indeed interesting to observe that, despite its limited size, Bodhgaya was selected among the 63 cities all over the country that would initially benefit from the Jawaharlal Nehru National Urban Renewal Mission (JnNURM) and a City Development Plan was prepared under it in the year 2006.in 2011, the Government of Bihar (GOB) prepared again a new ambitious City Development Plan in order “to develop Bodhgaya as an international tourist destination by preserving its cultural heritage and by providing all basic infrastructure services to its citizens and tourists in an eco-friendly way” (CDP, 2011). Yet, despite the peculiar attention that Bodhgaya managed to draw, improvements at the local level have been actually very limited. According to the mapping conducted by PRIA in 2012, the situation in the 19 slums of the city is still critical. Sewage systems are quasi-inexistent in most of the slums, and a great majority of the inhabitants still do not have access to private toilets. The government efforts have so far failed to address effectively these issues; very few urban poverty programs have been actually implemented by the Bihar Urban Development Agency (BUDA), and the funds channelled through the National Slum Development Program (NSDP) have been insufficient to generate any substantive impact (CDP, 2006). In this context of global visibility associated with a permanence of poverty, one slum singularized itself and experienced an unprecedented model of development. Mastipur, as the neighbourhood is locally known, underwent what we could call an “incidental rehabilitation”, as it benefited directly from its international exposure. The neighbourhood belongs to the ward 17 and is located in the vicinity of the Mahabodhi temple complex. Populated by Musahars (Scheduled Caste and Mahadalit Community as per GOB), the locality is today surrounded by the Japanese Buddhist temple and various hotels and guesthouses. 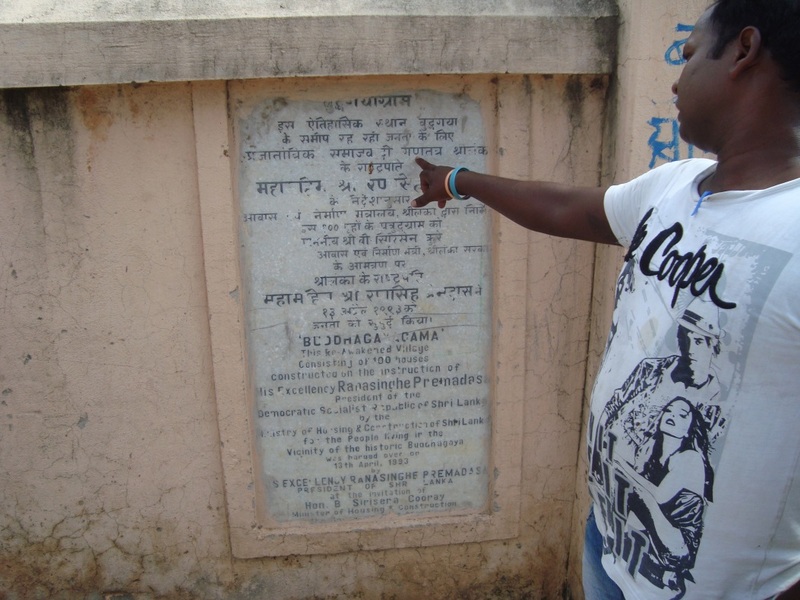 In the early 1990s, Mastipur received an unexpected international assistance. The Sri Lankan President of that time, Ranasinghe Premadasa, who was himself a devout Buddhist, could not bear that the paramount pauperism of Mastipur could be sustained on such a holy land. To put an end to this situation, he decided to launch under his own patronage a Rs75-lakh in-situ up-gradation scheme with the funds of the Sri Lankan authorities. View from the roofs of the slum, with a hotel complex in the background. The built environment of the neighbourhood was radically altered. 100 new concrete housing units were constructed – each featuring two rooms, one kitchen, and one bathroom. Each home got a taped connection to water supply, which is particularly rare in a city where only 10.5% of the inhabitants have access to such service (GOB, 2011). Proper roads and a community centre were also built at that time. On April 1993, the renovated neighbourhood was inaugurated by President Pramadasa himself, and officially renamed as “Buddhagayagama”, which means “The village of the re-awakened people” in Sanskrit. Board commemorating the rehabilitation scheme conducted by the Sri Lankan authorities. However, the tale of Mastipur did not eventually end-up in a totally rosy-masti way. 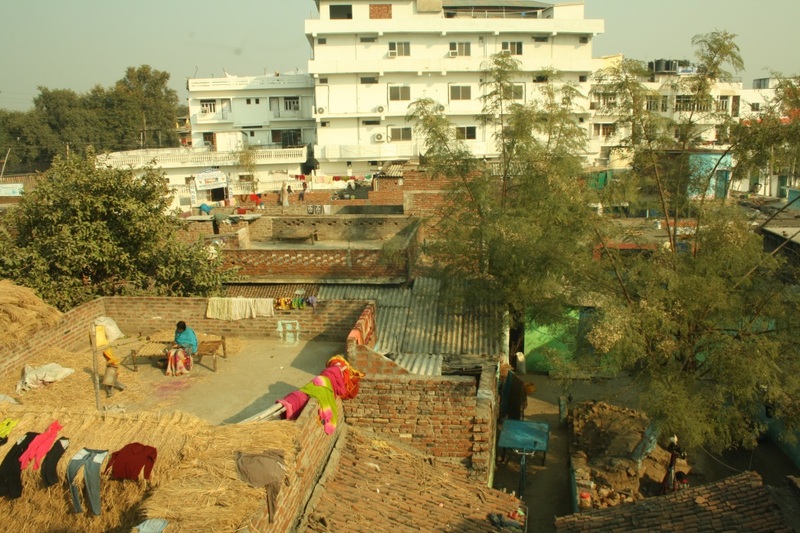 While the infrastructure of the neighbourhood is significantly better than most of Bodhgaya’s slums, its social situation is still highly problematic. The Sri Lankan project initially had genuine social ambitions. For instance, in order to address the livelihood issues, the Sri Lankan government provided thelas (pull carts), few cycle-rickshaws and training to make candles and incense sticks. The Government of Bihar issued licences to thela vendors for trading kerosene oil, but these licences soon became useless when a national law banned this activity. President Pramadasa also had in mind to develop a long-term network of exchange between slums dwellers of India and Sri Lanka. But in May 1993, only two months after the delivery of the new Mastipur, Pramadasa was killed during a terrorist attack by the Liberation Tigers of Tamil Eelam. Since this tragic death, the involvement of the Sri Lankan State faded away, to finally disappear. Such initiatives were not always fruitful. A Sri Lanka’s newspaper, the Sunday Time, for instance highlighted in May 1998 that the very rickshaws that had been distributed were quickly sold to be used in the trading activities of alcoholic products (http://www.sundaytimes.lk/980628/plus9.html). 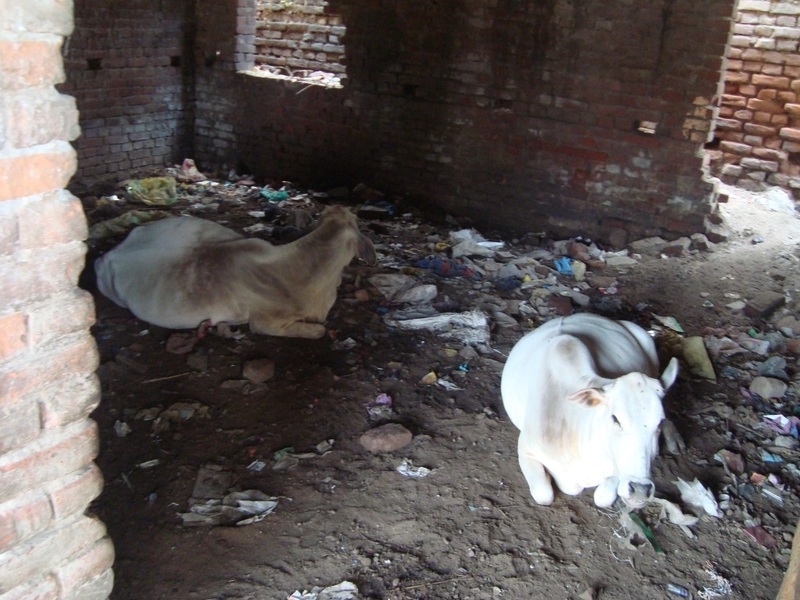 Field observations by PRIA also revealed a non-appropriate use of some infrastructures; the school, which was not part of the rehabilitation scheme, seems for instance more prone to shelter cows rather than students (see photo attached). Twenty years after the rehabilitation of the neighbourhood, the question of maintenance is also a matter of concern. Without material assistance available, the sustainability of the built-environment is today seriously questionable, and this problem will tend to be reinforced by the demographic growth which is adding up even more pressure on the infrastructures. Mastipur’s story highlights that slum up-gradation, whatever significant and well-intended it might be, must be compulsorily accompanied by a well-rooted follow-up, not only of the State but also of the local population. 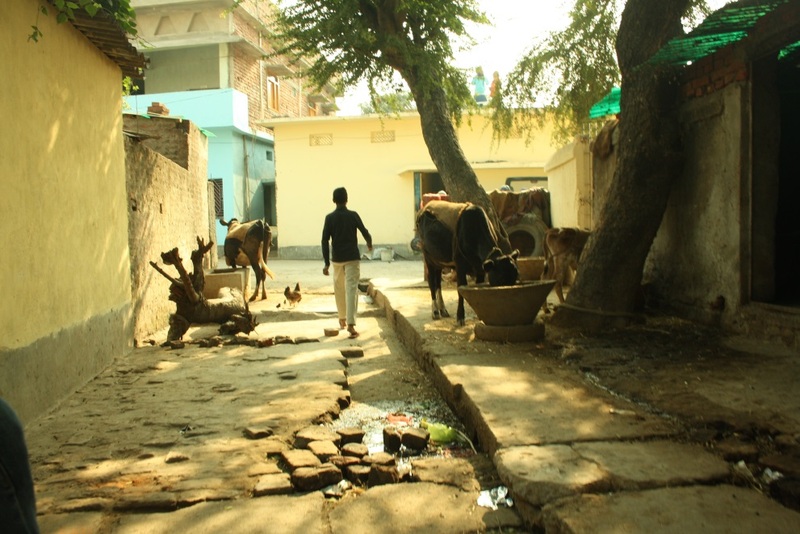 As compared to other slum areas in Bodhgaya, Mastipur was lucky enough to experience this “incidental rehabilitation” – however, the empowerment of its inhabitants was relatively not outstanding. During the whole process of rehabilitation, the participation of the community was feeble, and in the years afterwards the inhabitants did not collectively organize themselves to sustain and capitalize on the benefits of the programme, as mentioned above. One of the challenges now for Mastipur dwellers will therefore be to forge a platform upon which common issues could be discussed and rationalized at the scale of the neighbourhood. It is under this approach that PRIA has initiated in Mastipur a community-based organization called “Slum Improvement Committee”. In this committee, local problems will be debated on a regular basis and will thus be made more visible in the public sphere, so that local citizens can negotiate with the government and other agencies for their rights and entitlements. Slums – a phenomenon or aftermath of Urbanisation? Developing world has a new pace and vigour for growth, economic rise and urbanisation. 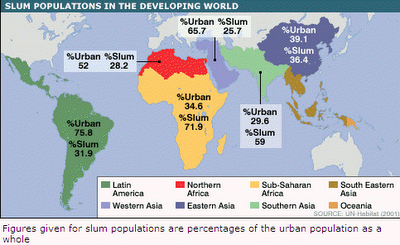 Southern Asia which is about 30% Urban already has its 59% of population in ‘Slums’. This is for sure an indicator that we are NOT PLANNING adequately. Like always, we lack vision and are taking restorative policies and actions to fix the already created ‘problem’ of urban poverty. Cities are now seen as an abode for ‘income’ generation, the opportunities, business, links and networks it offers not just nationally but also internationally is what draws more and more people to cities. So how is it that we are visualising these pools of urban poverty, at the same time new entrepreneurs of the city? How it is that planning and civil society should deal with this phenomenon? Are slums only about lack of services or urban poverty has a much larger- hidden dimension to it? Are the urban schemes of our cities equipped to handle this phenomenon? Such are the various questions that need an immediate pondering and discussion..